(From Sigma lens literature) This ultra-telephoto lens has a fast maximum aperture, and also features a new super multi-layer coating, which optimizes the characteristics of digital SLR cameras. Two ELD glass elements in the front lens elements reduce chromatic aberration to a minimum and also ensure sharp, quality images of high contrast. The AF drive for Sigma SA, Canon and Nikon SLR cameras features Sigma's ultra-quiet and high-speed Hyper Sonic Motor (HSM). 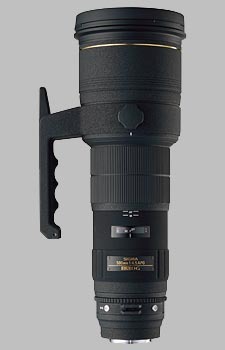 By adding an APO teleconverter (optional extra), you can use this lens as a 700mm f/6.3 MF ultra-telephoto lens with a 1.4X EX teleconverter, or as a 1000mm f/9 MF ultra-telephoto lens with a 2X teleconverter. I've purchased this lens for handheld using, and it work perfectly for birdwatching. This 500mm is relatively lightweight, few weight more than Nikkor 300/2.8. The AF is quick and precise with both the D2x and D700. Sharpness is great from f4.5, colors are ok, with no cromatic aberration or fringing. I have the DG version, with the HSM motor for Nikon. I'm only disappointed to lost AF with the Teleconverter: it is indispensable for a lens like this. I bought my lens used from a charity shop - it's the earlier APO version which has the 'Camo' paintjob and manual focus. IQ is fantastic at full aperture and the sliding lens hood makes the lens easier to store and use. Compared to my Canon 400 F2.8 IS L. this lens is very small and compact. I now have 2 sigma super teles and would recommend either. The other a 400 F5.6 APO is also excellent and a fraction of the cost of the similar Quality & aperture Canon lens. Well worth checking out if you can find one used for a good price. The 500mm sigma offers few compromises yet offers excellent value for money and supurb performance. Perhaps not quite as sharp as my previous 300mm f2.8 but it is sharper than the 300 + 1.4x tc. AF is swift and sure, plus the lens nails the focus, none of the slight front focus my 300mm had. Very good but it would be nice to get weather and dust sealing into the bargain. Even without this all you need is a sleeve cover and its fine. The tripod mount is stable and in just the correct place for a handle when hand holding. Fantastic, i dont really need to say anything more. Good colour, contrast, sharpness. The Bokeh is not the best but certainly above average. I would recommend this lens to anyone who is looking for more than what the 80-400's and x-500mm zooms offer. This is a well made lens, what I call "a poor man's 500." I bought it, used, in September 2003. It has been a joy to operate. The Hypersonic Motor is as fast and quiet as the AF-S motors on my Nikon lenses. My experience has been that it is very capable of sharp images, but you do have to be spot-on with what you use as your focus target. Because of this lens, I have learned to use the AF-lock feature of my camera. Once the focus is set and locked, then recompose the shot. I normally operate this lens at f/4.5 and it performs admirably, with nice bokeh often resulting, even from busy backgrounds. The foot is solid and well made, with rotating collar that is easy to operate and adjust. The lens hood (not shown in this illustration) is a bayonette type of mount with thumb screw to lock it on. The lens hood reverses for storage. The Sigma soft case for this lens is just fine in its construction, offering ample protection. Filters can be used via a drawer located near the mount end of the lens. The drawer rotates which makes it easy for use with a circular polarizer. You'll need a good mount for this lens. I opted for a Gitzo Pro Studex 1325 CF set of legs and placed a Wimberley head with quick release and P50 plate for the lens. I also put a Manfrotto 3502 level head between the legs and mount, just to make set-up that much easier. I spent just more than half the price of the used lens for the mount and its been worth every penny. Concluding—I'd really prefer to have a Nikon 600 f/4, but given that I lack resources to own such a lens, I opted to go with the Sigma 500. I've not regretted it, and, after I win the lottery, I'd still keep it as an adjunct to the 600mm dream lens.